ARE PRECIOUS METALS SET UP FOR A BIG END TO THE YEAR? Are precious metals set up for a rally to end the year? Possibly, and here are four reasons why. First, we’re in a brave, new world. Precious metals are not only useful as a store of value and a means of exchange, but also represent a real inflation-hedge against fiat currency. The inflation-hedge aspect of precious metals, overplayed by many in the media in explaining daily movements in the precious metals market, has always been a component of demand for precious metals. This aspect has become stronger over the past decade with advent of ballooning central bank and government balance sheets. The question is often asked: Won’t precious metals decline when central banks and government policymakers become more reasonable in their money supply decisions (i.e. reducing the money supply)? To the casual observer, the answer is probably yes, because decreased money supply reduces inflation-risk. In fact, many investment professionals appear to have also adopted this view. Is it accurate to assume this? Perhaps, but to say that precious metals will decline when governments become more prudent in their financial management presumes that the money supply will decrease. When has the world’s money supply decreased? Rarely, if ever. Essentially, for the inflation-hedge aspect of gold and other precious metals to go away or subside, the money supply would actually need to decrease and this is highly unlikely. In contrast, what will likely happen is a slowing of the money supply growth, something that will continue to provide support for demand of precious metals. Second, precious metals seldom experience prolonged periods of price depreciation, as is shown by the pink shading in the matrix precious metals graph below. Gold is up about 370% since 2002. Gold’s history is one of either an upward or flat trajectory, with only three periods of extended price depreciation. The slowdown periods were March to December of 2008, September 2011 to May 2012, and October 2012 to June 2013. Silver is up a little more than gold since 2002, at 375%. Silver is more volatile than gold, although it has experienced only two prolonged periods of price depreciation. The two periods were March to October 2008 and April 2011 to June 2013 (some might consider certain dates within this second frame as more positive). Platinum’s historical experience is less positive, up about 200% since 2002. The smaller growth rate comes with the advantage that platinum has experienced much less volatility over the same time frame as gold and silver. The four periods of price depreciation for platinum are January to October 2011, March to October 2008, August 2011 to July 2012, and February to July 2013. 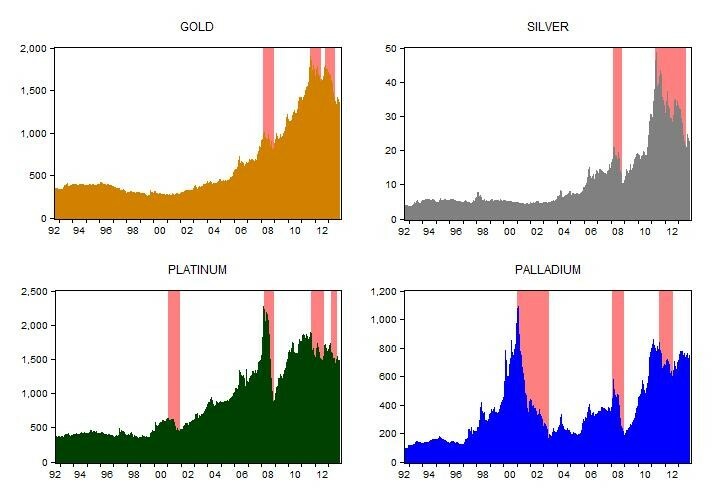 Palladium’s historical experience encompasses the highest amount of volatility of the precious metals group, with the metal up about 70% since 2002. Overall, palladium has experienced four periods of prolonged price depreciation. These periods are February 2001 to May 2003, February to November 2008, and August 2011 to July 2012. The third reason why precious metals are due for a good end to 2013 is reversion to trend. 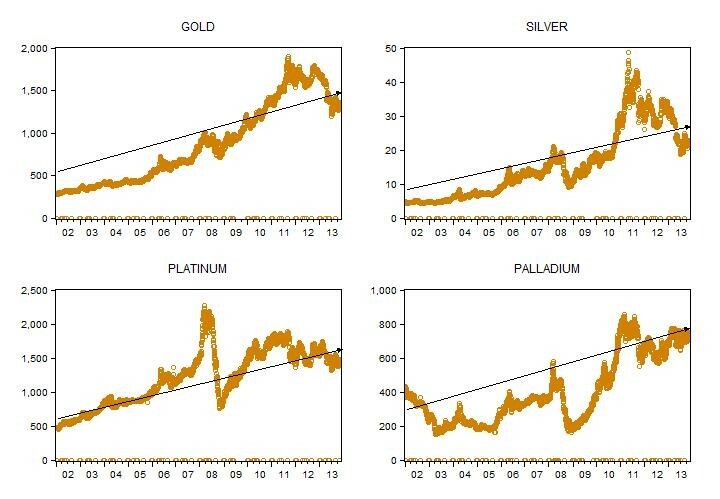 All four precious metals are now floating below what longer-term trend lines would indicate their price should be, as is shown in the following figure. Unless the trend line shifts lower (which is unlikely), precious metals are due for some price appreciation. Finally, there is real risk that November and December’s economic data will show a slowing, rather than accelerating, economy. With weak economic conditions the most probable scenario for the upcoming Christmas season, it’s unlikely that central banks will tighten or taper. Overall, precious metals are due for a good end to 2013. The reasons behind the forecast include continued imprudent government financial management, little history of prolonged price depreciation in the precious metals arena, a reversion to upward trends, and likely poor economic data for November and December providing more than enough push for gold, silver, platinum, and palladium to see strong gains over the next couple of months. The CC Holdings Group has offices in Switzerland and in the United Kingdom, and provides clients with financial services including physical bullion, deliverable foreign exchange, custody and payment services. This information is intended to assist investors. The information does not constitute investment advice or an offer to invest or to provide investment services and is subject to correction, completion and amendment without notice.